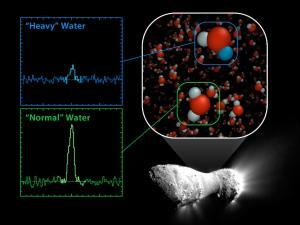 Comets are some of the most fascinating objects that astronomers study. They tell the story of their solar system, as most were created during the very early period when the system was first formed. Looking at them, we are able to see where we’ve been and, sometimes, we can reaffirm scientific theories based on the information we receive through studying them. One of the most fascinating things that has been discovered is a comet storm going on in a solar system not far from our own. 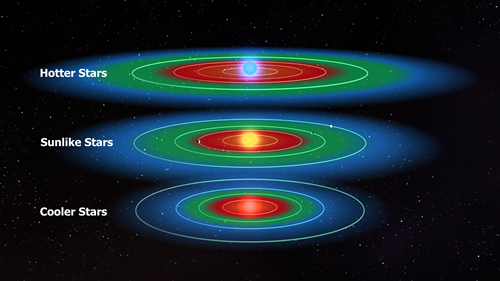 This solar system is some 40 trillion miles away (not very far, cosmological perspective). This system is experiencing something that is similar to the “late heavy bombardment period” in our own solar system. This is a period in which icy comets were sent from the trenches of the outer solar system, inwards to the rocky planets. The Late Heavy Bombardment period occurred when our solar system was still very young, approximately 600 to 800 million years old. 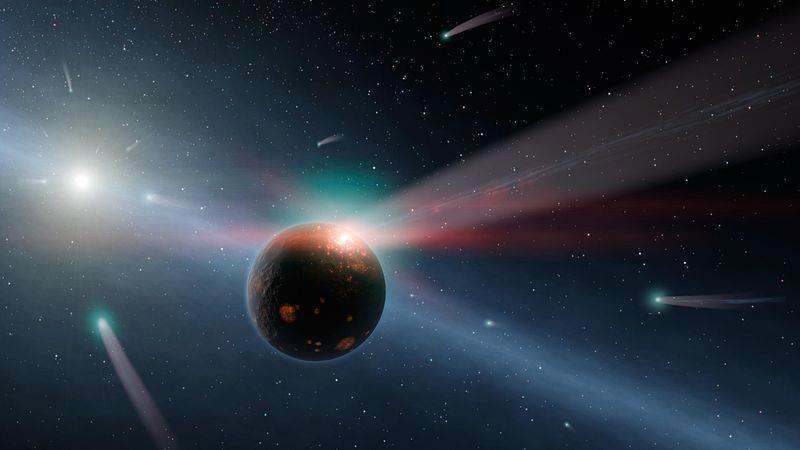 It’s theorized that the gaseous, icy bodies of the outer solar system migrated a bit, jousting comets from the Kuiper Belt or the Oort Cloud about, which sent them flying inward, some of them undoubtedly crossing into the orbits of unsuspecting planets or moons. The collisions delivered collections of water, carbon, and organic materials to the bodies they collided with (fun fact: one of the prevalent theories surrounding the mystery of Earth’s oceans is via comet collisions). Located in the constellation of Corvus, there is a f-type main sequence star named Eta Corvi. This star is about 40% more massive than the Sun, but only about 30% as old (making it about one billion years old). The young star has two debris disks surrounding it, one of which is only a few AU’s (Earth – Sun distances) away from the star. The other is about 150 AU distant; this is where the small, rocky, icy remnants from the formation of the solar system reside, similar to the Kuiper Belt in our solar system. Infrared detectors aboard NASA’s Spitzer Space Telescope noticed something strange was going on in the Eta Corvi system. It appeared as if comets were being torn to shreds after a collision with a rocky body in the inner solar system. 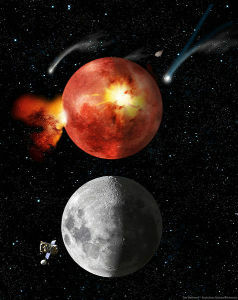 If this analysis is correct, then the Eta Corvi system is approximately the same age our solar system was when the late heavy bombardment period commenced, suggesting that theories about the impact craters on the moon during the late heavy bombardment period are correct, or at least not far from the mark. The most interesting part is that the light signature that’s emitted by the dust disks from a collision between a comet and a rocky body is similar to the composition of the Almahata Sitta meteorite that fell to Earth across Sudan in 2008. This suggests that the comets have a common origin in their respective star systems, most likely the far edge that has conditions that are friendly to a reservoir of icy bodies such as these. This brings one interesting question to fruition: could a similar solar system to our own exist so close to home, or at least one that may resemble ours in a few billion years? While the dusts disks are a bit farther out than the orbit of Mars, this star is significantly warmer than the sun. Therefore, the dust disks we’re observing may very well be indicative of a collision between a planet and a comet that exists within the goldilocks zone of the solar system (the space where water could remain in liquid form). One thing is for sure: studying this system may be our best bet at understanding the events between the late heavy bombardment period and the time when Earth was the most hospitable for the ingredients for life to exist and thrive. Was an Exploding Star Responsible for the Red Crucifix of 774 AD? Real or Photoshopped? You decide.